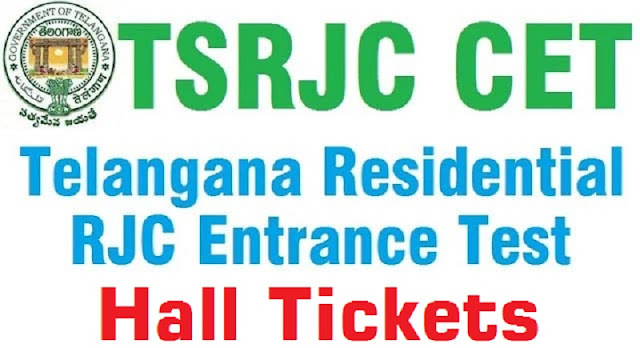 #TSRJC CET 2019 Hall Tickets Download: TSRJC CET 2019 #HallTickets, TSRJC Entrance Test 2019 Hall Tickets, TSRJC Admission Test 2019 Hall Ticket: Telangana Residential Educational Institutions Society issued TSRJC Common Entrance Test 2019 Notification in March, 2019. TSRJC CET 2019 Exam for admissions into regular Intermediate Courses in Telangana Residential Junior Colleges in TS State for the academic year 2019-2020. TREIS invited online applications from the eligible candidates for admission into Intermediate courses in its TSRS Junior Colleges. The students who have attend SSC exams in 2019 were applied online through official website http://tresidential.cgg.gov.in/default.aspx or http://tsrjdc.cgg.gov.in/ for this TSRJC Entrance Test 2019 notification stream. TREIS Officials will be uploaded hall tickets of TSRJC Entrance Test 2019 on their official website. Candidates can download their admit cards/ hall tickets from TREIS Website and appear for the TSRJC Test at the given center. Hall Ticket is an important document. Please preserve it carefully till the admissions. The Telangana Residential Educational Institutions Society would be conducting TSRJC CET 2019 on May 10 from 10 am to 12:30 pm for admission of students into 1st year Intermediate for the year 2019-18. The examination would be conducted at two general and two minority colleges in the State. The Telangana state Residential Junior College(TSRJC) Common Entrance Test-2019 for the four residential junior colleges run by Telangana Residential Educational Institutions Society (TREIS) would held on May ..... A total of 42,542 students who have applied for the test would be taking part in the examination from 178 centres in various districts of the State. The exam will be conducted between 10 am to 12.30 pm. Under general category, the college for Boys is at Sarvail, Nalgonda district and for girls at Hasanparthy, Warangal district. Under Minority category, the two Colleges are at Nagaram, Nizamabad district and L B Nagar at Nagole in Hyderabad. A. 1. Candidates can download their Hall Tickets from the website at http://tresidential.cgg.gov.in/default.aspx or http://tsrjdc.cgg.gov.in/ with the reference number allotted to them.